Maz Kanata is a fictional character in the Star Wars franchise. Introduced in the 2015 film Star Wars: The Force Awakens, she is a CGI character voiced and performed through motion capture by Lupita Nyong'o. Maz, a former pirate and smuggler, is more than 1,000 years old and manages an interstellar tavern in a castle on the fictional planet Takodana. We really wanted the story to feel authentic, despite being a wild fantasy. I mentioned Rose in an early story meeting as a sort of timeless, wise figure that I'd actually known in my life ... While we experimented with many looks and styles before settling on the character's final design, Rose was always at the center of the inspiration for Maz. Nyong'o's meeting with Abrams about an undisclosed role was reported in March 2014, and her casting in the film was first announced on April 29, 2014. Nyong'o was revealed to be playing a performance capture-CGI character, pirate Maz Kanata, in a May 2015 Vanity Fair photo shoot by Annie Leibovitz. The character was first heard in the official TV spot for The Force Awakens, released in November 2015. Days later Abrams confirmed fan speculation that Maz was pictured on the film's theatrical poster, which had been previously released in October 2015, as a diminutive alien wearing large goggles. In December 2015, the orange-skinned character appeared briefly in a video for the Disney XD channel, featuring a scene in which John Boyega's character Finn draws his lightsaber. Of Abrams' emphasis on the character's eyes, Nyong'o commented, "As an actor for films, your eyes are a lot of the way you communicate anyway. So it was definitely a gift to have that be the means to her magic as a motion-capture character." Nyong'o was also coached on performance-capture work by her The Force Awakens costar Andy Serkis, who portrays CGI character Supreme Leader Snoke and had previously portrayed numerous other motion-capture roles in other films. She said, "The biggest advice he gave me, that was so important to hold on to, is a motion-capture character you develop the same way as any other. You have to understand who the character is and what makes them who they are." Actress Arti Shah was cast as the motion capture double for the character's body movements. Abrams added that "her eyes are an important aspect of her character". Entertainment Weekly's Anthony Breznican noted, "Maz is this movie's wise, ancient alien with connections to the mystical side of the galaxy." Of the character's alien species and planetary origins, Abrams said that though The Force Awakens does not answer these questions, more information about Maz is forthcoming "in other venues". In the film, Han Solo visits his old friend Maz at her tavern, seeking her aid in returning the wayward astromech droid BB-8 to the Resistance. Maz, who has a crush on Han's copilot, the Wookiee Chewbacca, is intrigued by Han's companions, the renegade stormtrooper Finn and the scavenger Rey. First Order stormtroopers, led by Kylo Ren, attack Maz's castle in search of BB-8, who has been entrusted with an important map. Maz tries to give Luke Skywalker's long-missing lightsaber to the Force-sensitive Rey, but she refuses it after experiencing a disturbing vision from touching it. Maz then entrusts the lightsaber to Finn, who uses it multiple times before it is eventually claimed by Rey. One trailer for the film included a shot of Maz handing Luke's lightsaber to General Leia Organa, though the corresponding scene was not included in the final cut of the film. Abrams explained the removal, saying "Maz used to continue along with the characters back to the Resistance base, but we realized that she really had nothing to do there of value, except to be sitting around." In December 2015, producer Kathleen Kennedy confirmed that Nyong'o was among those who would reprise their roles in the forthcoming sequel to The Force Awakens, Star Wars: The Last Jedi. In the film, Maz appears in one brief scene via hologram, aiding Poe, Finn and Rose by instructing them to find the master codebreaker in Canto Bight. She is shown in the midst of a firefight, which she calls "a union dispute". Maz will appear in Star Wars: The Rise of Skywalker, with Nyong'o reprising the role. Maz appears in the short form computer animated series Lego Star Wars: The Resistance Rises in the 2016 episode "Hunting for Han". The character also appeared in the Lego Star Wars: The Freemaker Adventures episode The Test. Maz appears in the micro-series Star Wars Forces of Destiny, voiced by Lupita Nyong'o. Maz is also a playable character in Lego Star Wars: The Force Awakens. Her role in the game is basically the same as in the film, although she has a prominent role during the battle of Takodana (in Chapter 6). Maz is featured in a Lego Star Wars playset called Battle on Takodana, and Hasbro's Star Wars: The Force Awakens Takodana Encounter action figure set. The character also appears in the 2015 novelization of The Force Awakens by Alan Dean Foster. Time's Stephanie Zacharek described Maz as "a delightful minor character ... who looks like the love child of E.T. and Lena Horne". Richard Roeper of the Chicago Sun-Times named Maz one of the film's "miraculous creatures", and James Robins of the New Zealand Listener deemed the character "a charmingly rendered alien". Writing for Forbes, Scott Mendelson called the scenes at Maz's castle "the film’s best sequence". Conversely, Matt Goldberg of Collider described the character as "the bar-owner/Yoda stand-in/exposition mouthpiece" and wrote, "What could have been a strong addition to the franchise instead reeks of the film’s attempt to mimic what works well in the previous movies." 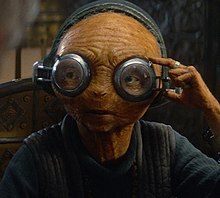 The Force Awakens received seven Visual Effects Society Award nominations, including one for Outstanding Animated Performance in a Photoreal Feature for Maz Kanata. Nyong'o was nominated for a 2016 Saturn Award for Best Supporting Actress for her portrayal. ^ a b c d e f g h i j k l m n o Breznican, Anthony (November 12, 2015). "Star Wars: The Force Awakens: J.J. Abrams reveals backstory of alien Maz Kanata". Entertainment Weekly. Retrieved January 14, 2016. ^ a b Sharpe, Frances (December 24, 2015). "Star Wars Character Based on Late Pali High English Teacher". Palisadian-Post. Retrieved January 14, 2016. ^ Kit, Borys (March 14, 2014). "Lupita Nyong'o Meets With J.J. Abrams for Star Wars: Episode VII". The Hollywood Reporter. Retrieved March 17, 2014. ^ Robinson, Joanna (May 4, 2015). "Adam Driver and Lupita Nyong'o's Characters Revealed in Exclusive Star Wars: The Force Awakens Photos". Vanity Fair. Retrieved May 4, 2015. ^ "Star Wars: The Force Awakens Theatrical Poster First Look, In-Theater Exclusives and More". StarWars.com. October 18, 2015. Retrieved January 14, 2016. ^ Child, Ben (December 9, 2015). "Lupita Nyong'o's Maz Kanata revealed in new Star Wars: The Force Awakens video". The Guardian. Retrieved January 14, 2016. ^ "Interview: Arti Shah – Maz Kanata from Star Wars". BBC Radio. January 31, 2016. Archived from the original on August 5, 2016. Retrieved August 5, 2016. ^ Malan, Rob (April 18, 2016). "Arti Shah: Bringing Maz Kanata To Life". ScififantasyNetwork.com. Archived from the original on April 18, 2016. Retrieved August 5, 2016. ^ "Databank: Maz Kanata". StarWars.com. Retrieved January 13, 2016. ^ a b Breznican, Anthony (December 22, 2015). "J.J. Abrams explains those missing scenes from Star Wars: The Force Awakens". Entertainment Weekly. Retrieved January 15, 2016. ^ Ruby, Jennifer (December 17, 2015). "Star Wars producer Kathleen Kennedy confirms that entire cast will return for eighth film". London Evening Standard. Retrieved December 17, 2015. ^ Kroll, Justin (July 27, 2018). "Star Wars: Episode IX Announces Cast; Carrie Fisher to Be Featured". Variety. Retrieved July 27, 2018. ^ Fitzpatrick, Kevin (June 10, 2016). "Maz Kanata, Lando and More Pop Up in New LEGO Star Wars: The Freemaker Adventures Trailer". ScreenCrush. Retrieved July 5, 2016. ^ Breznican, Anthony (April 13, 2017). "Star Wars highlights female heroes in Forces of Destiny". Entertainment Weekly. Retrieved April 13, 2017. ^ "75139-1: Battle on Takodana". Brickset.com. 2016. Retrieved January 13, 2016. ^ "Minifigs: sw703: Maz Kanata (75139)". Brickset.com. 2016. Retrieved January 13, 2016. ^ Foster, Alan Dean (2015). "Chapter XI". The Force Awakens (e-book). ISBN 9781101965504. ^ Robins, James (December 17, 2015). "Film review: Star Wars: The Force Awakens". New Zealand Listener. Retrieved January 13, 2016. ^ Goldberg, Matt (December 22, 2015). "Star Wars: The Force Awakens: The Many Problems with Maz Kanata". Collider. Retrieved January 15, 2016. ^ "The 42nd Annual Saturn Awards nominations are announced for 2016!". Saturn Awards. February 24, 2016. Archived from the original on June 26, 2012. Retrieved March 4, 2016.